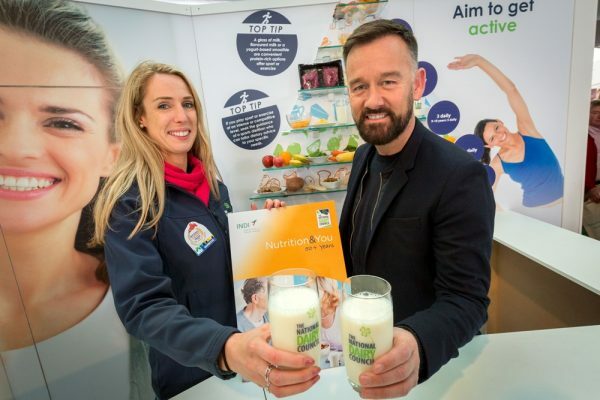 He was speaking at the launch of a new booklet entitled ‘Nutrition & You; 50+ Years’, produced by the National Dairy Council (NDC) and endorsed by the Irish Nutrition & Dietetic Institute (INDI). This booklet covers topics such as bone and muscle health, keeping active and practical food choices. Dr. Mariane Walsh, Nutrition Manager, National Dairy Council with Brendan Courtney, Broadcaster and Designer. Getting older doesn’t mean we have to slow down as it can be a great time to embrace new opportunities and adventures. To enjoy this phase of life to the full, we need to maintain our strength and vitality; whether we chose to continue working, take up new hobbies or run after the grandchildren. It is well documented that people are living longer and by 2030 it is expected that one in five people in Ireland will be aged over 65 years. “It sounds obvious perhaps, but many of us are creatures of habit who enjoy particular foods or plan our shopping and meals in particular ways which we have grown comfortable with. It’s good to step back every now and then and think about what our bodies need,” says Dr. Walsh. 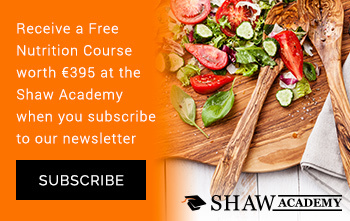 Dr. Walsh says that a balanced and varied diet can provide the wide range of nutrients needed at various life stages, referring to the Department of Health’s food pyramid as a guide to the types and amounts of food recommended for good health. Our skeletons act as a supporting framework to our bodies and work in conjunction with our muscles for movement and agility. Muscle also acts to protect our bones by preventing and easing falls. Dr. Walsh explains that bone is a living tissue which is constantly rebuilding and renewing – with old bone broken down and replaced by new bone throughout our lives. In older people the rate of bone formation declines, resulting in age-related bone loss. At present it is estimated that 300,000 people in Ireland have Osteoporosis and that one in two women and one in five men over 50 years will develop a fracture in their lifetime, due to this bone weakening condition. Hip fracture is one of the most serious associated concerns with significant mortality rates and the risk increases with age. “A number of factors will influence the rate of age related bone loss – ranging from genetics, nutrition, smoking, levels of alcohol consumption and whether we take part in weight bearing exercises, like brisk walking, jogging or climbing stairs regularly,” says Dr. Walsh. “Including good sources of calcium, protein and vitamin D as part of a balanced diet in combination with such exercises can make an important contribution to bone health,” says Dr. Walsh. Keeping muscles healthy is not just a task for athletes; we need our muscles to perform everyday tasks such as housework or going up the stairs. Sarcopenia is the term given to an age-related loss of skeletal muscle mass and function, which impacts physical ability and quality of life. It is estimated that up to 33 % of the population have clinical sarcopenia (REF 1). Speaking generally, after the age of 50 we naturally lose about 1 % of our muscle mass per year and these small losses can accumulate over time leading to a substantial decline in strength and function,” says Dr. Walsh. Sarcopenia can cause fragility and loss of independence, increasing the risk of falls and fractures. It is also associated with poorer health consequences such as obesity, osteoporosis and diabetes, contributing to the economic burden on our healthcare systems (REF 2). The old saying, “use it or lose it” is quite apt when it comes to our muscles. While physical activity is crucial in maintaining a healthy skeletal muscular system, it is also vital that we supply it with the key nutrients needed for growth and recovery. Calcium and protein are among these essential nutrients which contribute to normal muscle and bone strength. Timing and quality are important when it comes to our consumption of protein and the optimal approach is that we spread our intake across the day rather than concentrating a larger amount at one meal. This enables the body to be efficient in supplying the constant amounts needed by active muscles throughout the day. Animal based proteins, which include dairy, lean meat, poultry, fish and eggs are the richest sources, with legumes such as beans and lentils also providing some protein. There has been extensive research into the properties of whey protein (a milk protein) and its role in muscle maintenance. Research indicates that this type of dairy protein is particularly beneficial for muscle growth and repair. By maximising the body’s ability to regenerate muscle, it is a step in the right direction in the fight to slow down age related conditions such as osteoporosis and sarcopenia. Dairy foods such as milk, yogurt and cheese are good sources of calcium and protein in the diet. In addition, these foods contain a matrix of other nutrients such as phosphorous, potassium, vitamin B2, vitamin B12 and iodine, which all have important roles in health. The calcium in dairy foods is considered to have good bioavailability, which means it is easy to absorb and use by the body. A National Survey in Ireland indicated that the over 65 age group are falling short of the Department of Health’s recommendations for 3 servings per day from the ‘milk, yogurt and cheese’ food group (REF 3). “As a nutritionist, I would advise that people aim to meet these recommendations in order to benefit from the rich matrix of nutrients they provide. Incorporating them into a varied diet and using the Food Pyramid as a guide is best. Examples of one serving of dairy foods include 200ml of milk or 125ml of yogurt or 25g of hard cheese”. Dairy foods are recognised as versatile nutritious and convenient foods that can be enjoyed across meal and snacking occasions, in cooking and baking. REF 1: Cruz-Jentoft AJ, Landi F, Schneider SM et al. Prevalence of and interventions for sarcopenia in ageing adults: a systematic review. Report of the International SarcopeniaInitiative (EWGSOP and IWGS). Age Ageing. 2014; 43(6):748-59. REF 2: Denison HJ, Cooper C, Sayer AA et al. Prevention and optimal management of sarcopenia: a review of combined exercise and nutrition interventions to improve muscle outcomes in older people. Clin Interv Aging. 2015;10: 859-69.